by Tony Perkins: Just when people stopped talking about Google's post-Trump cry-fest, the company has another PR disaster on its hands. 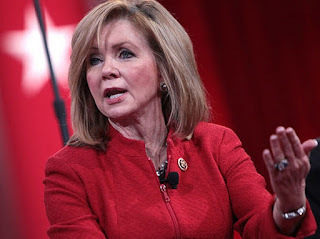 Weeks after the tech giant was outed for calling the president's supporters "facists," "haters," and "extremists," Breitbart published a nasty email chain from Google's Blake Lemoine calling Rep. Marsha Blackburn (R-Tenn.), among other things, a "terrorist." Of course, Blackburn's been a longtime target of the tech industry -- starting last year when social media started censoring her campaign ads. In 2017, Twitter actually took down one of her pro-life videos, insisting it was "inflammatory" to bring up Planned Parenthood's baby body part ring. When she protested, Twitter replied that it wasn't an accident. "[I]t appears that the line in this video specific to 'stopped the sale of baby body parts' has been deemed an inflammatory statement that is likely to evoke a strong negative reaction. If this is omitted from the video it will be permitted to serve." It was one of the many incidents that led Marsha to write an open letter to Silicon Valley on Fox News. "My Tennessee constituents have expressed concern over having their Christian movie trailers taken off YouTube, or their Facebook accounts being disabled, or their posts on Twitter being censored. As I said, I had a personal experience with the latter this last fall, and it was deeply troubling." Like a lot of conservatives, she demanded better. "If these companies truly believe in a free and open internet, they should allow an honest and open public discussion -- even when that means views they disagree with in 'flyover country' are highlighted. If they don't believe in that level of neutrality, perhaps we should heed Mr. Zuckerberg's advice and consider holding them to a higher standard that acknowledges their responsibility." Google's Lemoine saw her column and unloaded in a politically-charged email. "We certainly shouldn't acquiesce to the theatrical demands of a legislator who makes political hay by intentionally reducing the safety of the people who she claims to protect," he wrote. "I'm not big on negotiation with terrorists." Insisting she was a "violent thug," Lemoine argued that "taking down libel is not censorship." "She's a lying liar who lies and Twitter treats her like one." Obviously, Google's bias isn't anything new. But this is especially significant since Lemoine is part of the company's search team, meaning that he helps create the algorithms that seemed to be increasingly skewed against conservatives. Google, of course, declined to comment. (It said enough already.) Marsha's campaign, on the other hand, had plenty to say. "Marsha Blackburn is a mother, a grandmother, a friend, a dedicated public servant, a pro-life champion, an ally for veterans, and an advocate for lowering our taxes and cutting regulation. To call her a terrorist is offensive and degrading. These emails are indicative of the bias conservative women in the political arena face every day. Liberals do not want them to have a voice in the public arena, and too many social media employees carry their bias to work with them." At last year's NRB convention, Marsha and I talked extensively about media censorship. Like a lot of conservatives, we think it's time for companies like Google to start embracing First Amendment principles. After all, she said, "What's the value of platforms that care more about inserting their biases than in providing a neutral place for people to discuss their ideas?" Probably about the same as an employee who isn't capable of common courtesy, let alone open debate. Tony Perkins is President of the Family Research Council . This article was on Tony Perkin's Washington Update and written with the aid of FRC senior writers. Tags: Tony Perkins, Family Research Center, FRC, Family Research Council, Google, Rep. Marsha Blackburn To share or post to your site, click on "Post Link". Please mention / link to the ARRA News Service and "Like" Facebook Page - Thanks!